The Chromebook Flip C302CA features a handsome 12.5-inch display running Full HD (1,920 x 1,080) resolution at 176 pixels per inch. The computer is actually pre-set to 1,536 x 864 (to increase text readability, we think), but this can easily be switched to maximum resolution. We found that colors looked sharp on the Flip, with appropriate sharpness, contrast, and white tint, but the glossy screen reflects too much light, and the default brightness is a bit low for our tastes. For a touchscreen — built to support up to 10 multi-touch inputs — it’s a quality offering. Unfortunately, “quality” isn’t enough to compete with the gorgeous display on the Samsung Chromebook Pro. The 12.3-inch screen runs 2,400 x 1,600 resolution at 235 pixels per inch, which is noticeably sharper than the Asus’ screen. The Pro’s display boasts bright, vivid colors and deep blacks, creating an excellent contrast to go with the high resolution, and the 3:2 aspect ratio, while unusual for a laptop, actually works well here, making the computer feel more natural while in tablet mode. In particular, Android apps can run comfortably in both portrait and landscape orientations, which is a rarity — even for dedicated tablets. 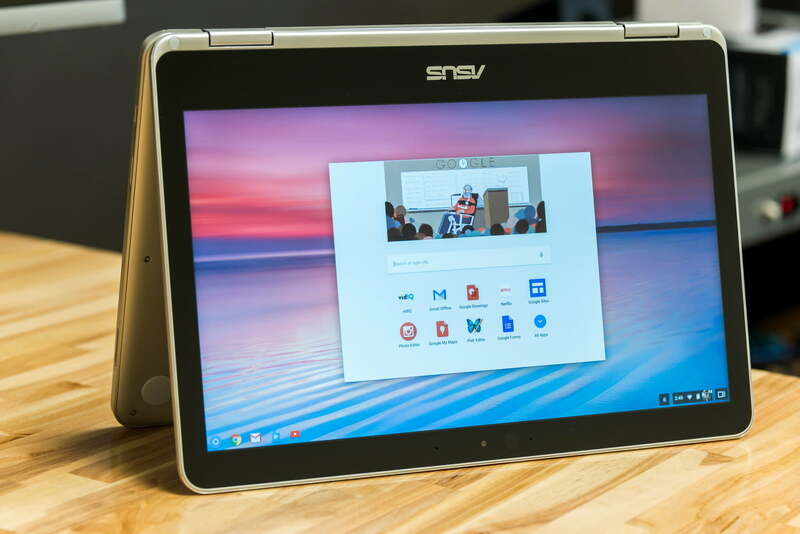 The Chromebook Pro — along with the accompanying Chromebook Plus, released last month — was billed as the first Chromebook designed with Android apps in mind. The computer has accelerometers and gyroscopic sensors built-in for tilting and steering in games, and the included digitizer pen can be extremely useful for taking notes and performing other tasks. The Intel Core m3 chip is easily powerful enough to breeze through most (if not all) apps available via the Google Play Store, even at maximum settings. There are a few minor issues — the computer sometimes lags while switching between Android apps and Chrome OS activities, and the “back” button is inconveniently located for use in tablet mode — but it’s hard to complain about a feature that no other Chromebook has. However, the Asus Chromebook Flip isn’t far behind. It also has an accelerometer and a gyroscope, and it has beta support for Android apps. It does not have a stylus — though that’s not a required feature for full support. Samsung’s model has only the slightest edge here. As we mentioned before, Asus lists three versions of the Flip on its website, but only one is currently available (unless you’re buying secondhand). For $500, you’re getting extremely good value in a 2-in-1, with a processor powerful enough to speed through nearly any activity. Compared to machines like the Lenovo ThinkPad 13 and HP Chromebook 13, you’re getting similar specs and more flash storage for about the same price — plus, it has a tablet mode. You can get the Flip on Amazon, though the Asus web store appears to be out of stock at the moment. 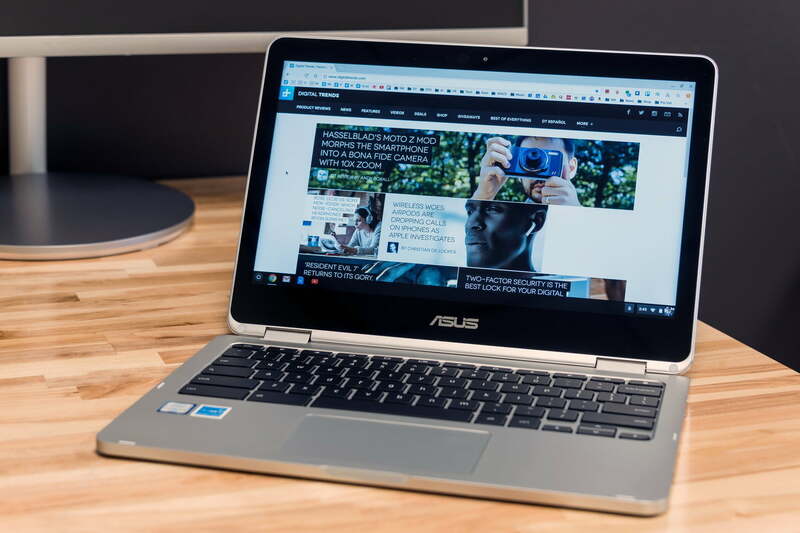 The Chromebook Pro isn’t out yet, so if you need a laptop this very second, you’ll have to go with the Asus. Ultimately, there’s not much difference between these two computers. Both are solid 2-in-1 options that function well in both laptop and tablet mode, with identical processors and generally similar specifications across the board. If you can’t wait any longer, go ahead and buy the Asus Chromebook Flip C302CA. It’s better than most comparable options, at an extremely reasonable price point. If you can afford to be patient, though, give it a pass until the Samsung Chromebook Pro releases in the next few weeks. For just $50 more, you’ll get a superior display and a stylus. Sure, it’s rough around the edges in a few places, but the advantages outweigh the drawbacks here. 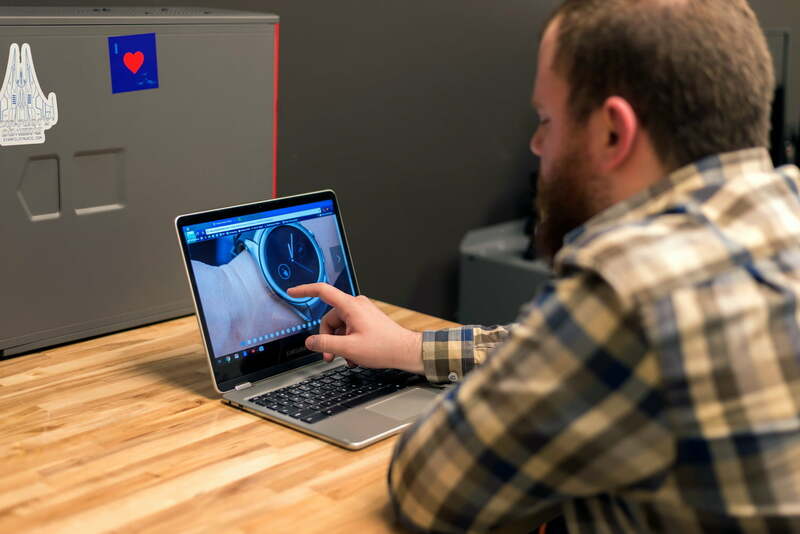 If you don’t think you’ll need the processing power of the Pro’s Core m3 chip, you can get the Chromebook Plus — which is otherwise identical to the Pro, right down to the great display — for less than $450 on Amazon.